The final group in the first stage features the world's greatest ever Pop/Session/R'n'B/Gospel drummer. 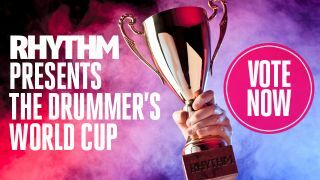 Your votes can help the world's greatest ever drummers to make it through to the knockout stages of Rhythm's Drummer's World Cup. The first round will comprise six categories, each with 20 drummers battling it out to progress in the competition. After this round, it's down to the last 16 - and that means it's a knockout! Simply vote for your favourite drummer in each round, and the top two in each group will progress to the next round (last 16), along with the next four drummers with the highest number of votes in any category. Voting is still open on the greatest ever Reggae, Ska & Funk drummer - here! And don't forget, you can still pick up a copy ofRhythm Presents 100 Drum Heroes, available in the shops,onlineand onNewsstand for iPad, iPhone and iPod Touchright now! It's got loads of interviews and profiles with a ton of drummers, plus it's beautifully illustrated with classic and new photographs!